Once upon a time, climbing ment reaching the summit of a mountain. Those were the days of men going where no man have gone before, leaving all they care about to achieve a goal no one will ever care about. Traditional climbers were never celebrities, no matter the results they accomplished. Well, who knows who sent Mt. Everes first? Do you? Still, these men continued conquering the mountains of the world, many of them giving their good health and even lives into the hug of a mountain, until all the peaks have been reached and all the big problems have been climbed. After all the challenge was gone, climbers turned around and asked themselves what to climb now? Luckily, the industry went their way, the innovations and improvements in gear set the stage for the birth of free climbing which turned climbng into a sport officially. Free climbing is grounded on a rule that it is allowed for a climber to use only the strength of a body to send a route. It means – no technical help from gear, just protection. And suddenly, no one was looking at the top of the mountain no more, the focus moved from adventure to performance and climbers became athletes. In came the market. In came the money. But, by your request, ADV brings back the adventure. ADV is normally doing the sport climbing, and we offer top-ropping as an must-try option to all our clientes. Top ropping the sport route guarantees the maximum safety and great new experience if you never climbed before. 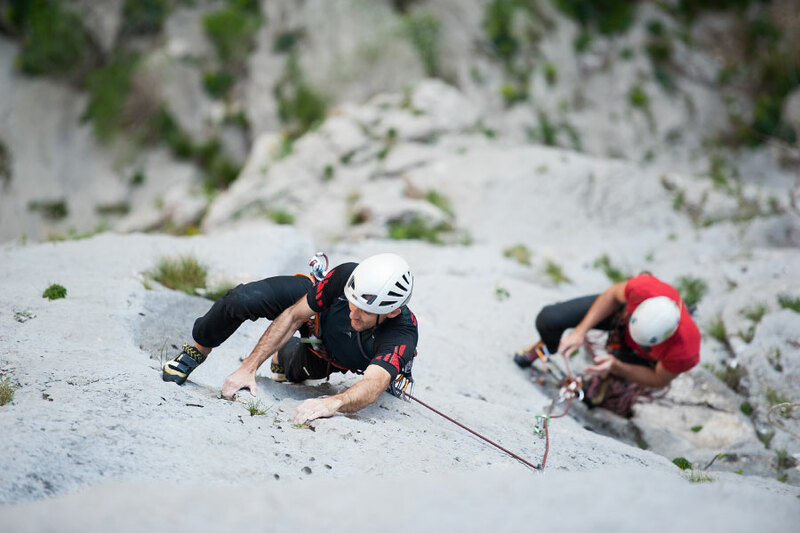 But, for those seeking the ultimate climbing adventure, we are always excited to take a try at a multi pitch climbing which is the closest to climbing traditionally. Only that it ‘s not really trad climbing, because all the routes are properly bolted, meaning the protection is already set all along the route. The point in multi pitching is to reach the top of a wall. To do so, we can not climb all the way up in just one take. 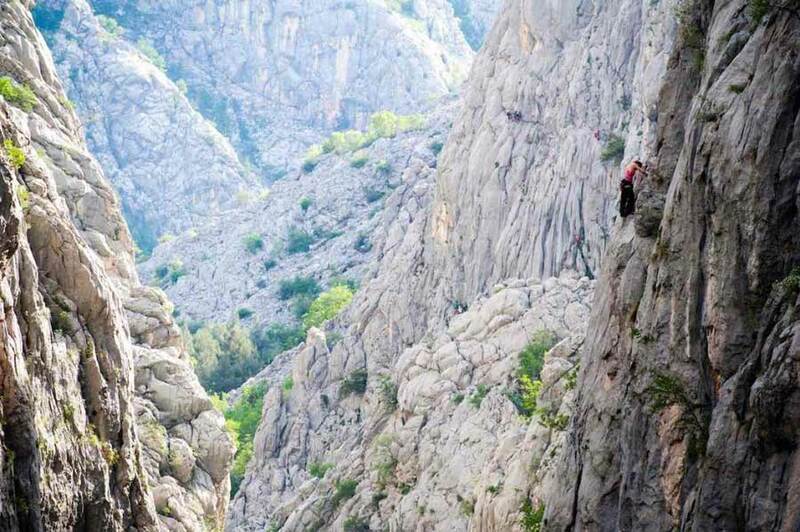 For example, if the route is longer then 100 meters, the climb would require a rope more then a hundred meters long. The weight and friction of a rope of that length would kill the climb. So, we organize to do it in more then one section – or pitch to use the climber’s slang – using a rope from 60 to 70 meters long though the pitches are rarely longer then 50 meters. Everybody needs a rest, you know. The first climber leads a pitch, protecting a climb by preclipping pre-placed bolts. Climber clips the quickdraws into a bolts and then clip the rope into a quickdraws. As leader climbs, the second climber belays the leader. After only a few moves up, climbers are usually not able to see nor hear each others. That’s why climbers use the exact forms of communication while multi pitching and any deviation in that command-and-answer channel may be the cause of a further problems. Some of them pretty serious. In a case of a leader’s fall, if everything is set right, belayer will not have problem catching a fall, even in ceses when leader and belayer don’t see nor hear one another, and the fall will be only twice the distance to a last protection. Just like in a single pitch leading. At the end of each pitch, leader sets a belay anchor and belays the partner up. 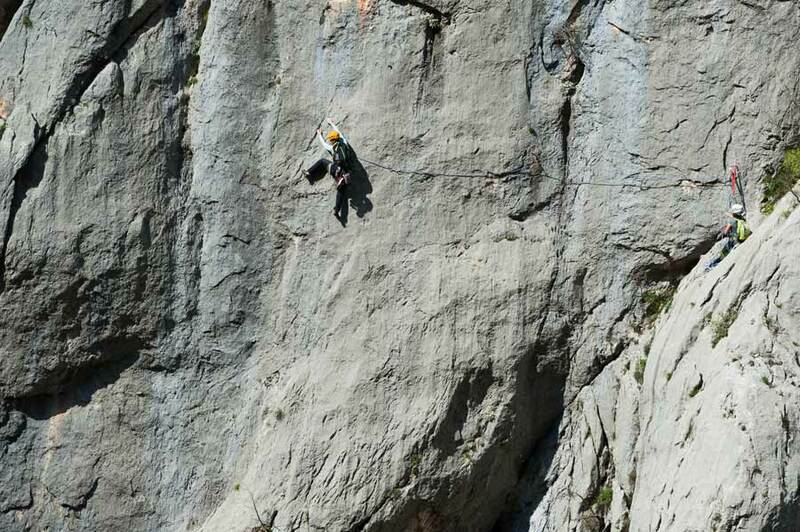 The second climber removes all the gear from a pitch and climbs up to a belay station. When she arrives at the belay station they reorganize the rack and one of them leads above. When the leader starts up the next pitch, the belay anchors provide the climbing team’s sole security, with a high-force fall possible. A good belay anchor generally has multiple anchors rigged together with cord or webbing to create a master point for clipping. This is a usual procedure when partners are both equally experienced climbers. In a guide-client relationship, client is not obliged to lead any of the pitches. You feel free to climb all the pitches as a second and let the guide do the hard part. Second climber has a top-rope all the way up (rope anchored above the climber), so climbing second is safer and less psychologically demanding then leading. But then again, our guides are all perennial climbers and they know all the routes really well, so you just be still, let them lead, the pleasure is ours.